For one weekend each summer, Greater Cincinnati will be the center of the hot sauce universe. Now that’s saying a lot! 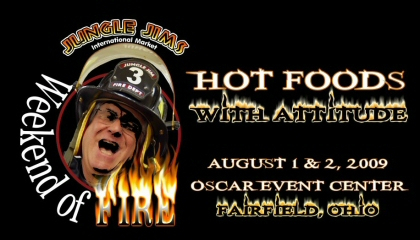 While this Marylander has never experienced what is known as the “Weekend of Fire” at Jungle Jim’s, but with over 55 vendors showing their hot sauce wares, this will be a chilehead’s paradise! Some new additions to the show (including the salsa contest) include having four portable restaurants set up in front of The Oscar Event Center during show hours selling BBQ food and roasted peppers and a brand new Harley Davidson Bike sitting in the main entry way! The infamous Defcon Hot Wing Eating Contest at Buffalo Wings and Rings will begin about 7:00 on Saturday Night along with a wrap-up dinner at Papadeux’s Restaurant on Sunday night. Wow, what a power packed week end of fire! !